The High Frequency Control Pad is a third-party controller for the Sega Mega Drive developed by Mad Catz. Little is known about this particular model, and all sightings have used Mad Catz's High Frequency branding intended for North American branches of Toys R Us. It may have been an exclusive to that store, possibly the oldest Mad Catz product for the system. 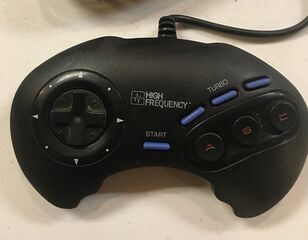 The High Frequency Control Pad is almost identical to a normal Mega Drive control pad, but with three blue turbo buttons and one slow-motion switch on the back. It was replaced with the more common Mad Catz 3 Button Controller which turned those buttons into switches, as well as giving the product a more unique design. A version with Tengen branding has also been found.